I do remember that row of resistors. I have spoken with TA before and I had asked if the driver was FET+Nxlinear regulator for regulation. He said no, and he said that he is instead using a resistor array for current regulation at low modes. You are not a fool at all. You made a good educated guess. You are also correct, I never posted any pictures of the drivers so it would not be stolen. It took me months and several prototypes and a ton of testing to get this design stable. In one case moving a component a few MM was enough to make it significantly more stable. Along with a few other equally minor but very important changes. This driver really changed how I look at building drivers in general, even the smallest details start to matter when messing with these kinds of currents. I was very surprised at the effects some of the changes had but the results are worth it, I have not heard of any issues with the almost 100 final versions of this driver that are floating around. Once I have time to put together a final version of the driver for release on oshpark I will upload it for personal use of course. Just got several other projects in the fire that are more important right now. Yeah, I was worried about this. I even sent them some sample drivers should good bypasses but it seems that was ignored. This is the first I have seen of it. They have not sent me any samples even though I have asked. Indeed, I never hid what I was doing, just exactly how I did it. The smallest details proved key to making it work stable under extreme conditions. This one is not bad, one is worst. I do wonder why they are still using steel springs instead of phosphor bronze or beryllium copper for the main spring, and make it even thicker since it screws down on a battery tube and not bare cells. Would avoid such bad solder jobs. Unfortunately many of my spring bypasses look like that. It takes me a few tries before I get one without solder sucked all the way up the wire and making it look like those. That’s not an excuse though. They should have practiced. At least folks with patience or good soldering skills can fix that. Yeah, that type of bypass works, for awhile anyways. 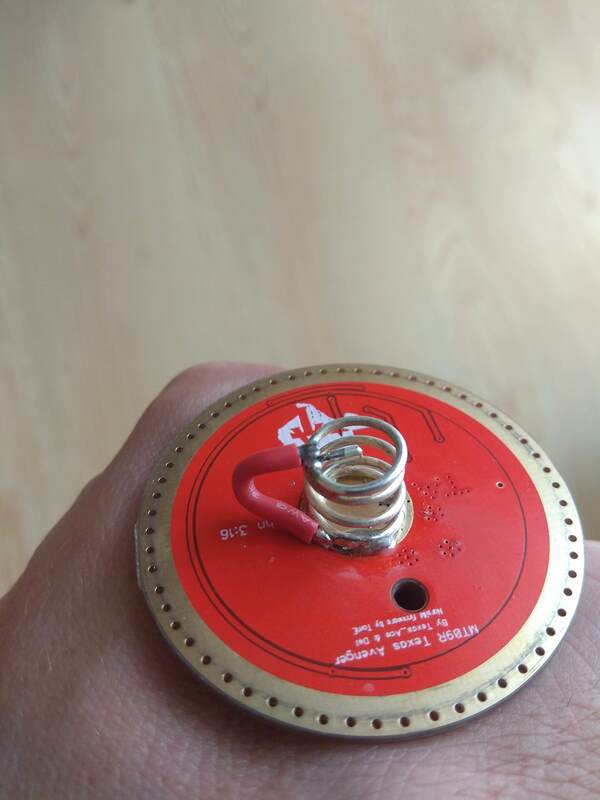 I find that wrapping the wire “around” the spring so that it does not flex as much when the spring is compressed lasts orders of magnitude longer. I have yet to have one break on me doing it that way but had most of my old ones like this break over time. luckily they never hurt anything when they broke, they just stopped being bypasses and the output dropped. I am still waiting for my replacement driver for almost a month now. To the member that received the replacement driver, how long did you wait for your replacement driver? Your driver should come very soon. I was waiting for my Haikelite MT01 driver and reflector, and they came today! I had emailed him, and he said the reason for the drivers taking time to be shipped, is that he was waiting to ship every spare part from almost every Haikelite light, the MT01, MT07S, MT03, etc, for lower cost shipping. This is why it’s taking time. I was waiting since Group Buy was over. I buy 3 pcs new MT09R and Dale send drivers with it by DHL. I’ve emailed multiple times about a replacement driver for mine but I’m not getting any response. I’ve given up on my light though at this point so if it comes, it comes, if not whatever, this thing will just sit in the bottom of a drawer somewhere. He only responded to me when the drivers were in my city in tracking. He has a lot of work on his hands, and probably 100+ emails to respond to. On one post on this thread since 7/8/2018. I understand Dale is extremely busy but how about some customer service for the members that purchase the light in first GB with the trust of the company. I am going to continue bumping this thread until someone responds. Yes, for the GroupBuy, he told me a shipping number and said he has shipped it before CNY, but it was shipped very late after CNY. So dont trust his words at all. I think he will ship at least yours. I have no answer depending the driver. what will bump help `? So this thread will not disappear. Hopefully, more people in the first GB will express their concern. I am sure I am not the only one. Well it’s been about 2 months for me since I was told my driver was sent out. So as long as you were told that you would be receiving a driver, the only thing you can do is wait. But if you never go in touch with HL to request a new driver, you need to reach out to HL and request one… Then wait. Ah ok, i guess the only way is to mail HL and bug them to send out the drivers, or that Dale guy but he seems to not write much here about it ? I did 2 months ago and during the 2 months, I only emailed them about 3 times. I was patiently waiting but when I email them again I don’t get any response anymore. I don’t think that is acceptable customer service. What is the acceptable wait time for you?